Karen Fagg's smile is the first thing visitors see when approaching the front desk inside the Chancellor's suite at the University of Illinois Springfield. She assists visitors quickly and with a kind and calm demeanor that helps to set the tone for the entire office. For these reasons and others, Fagg has been selected as the UIS Employee of the Month for July 2013. 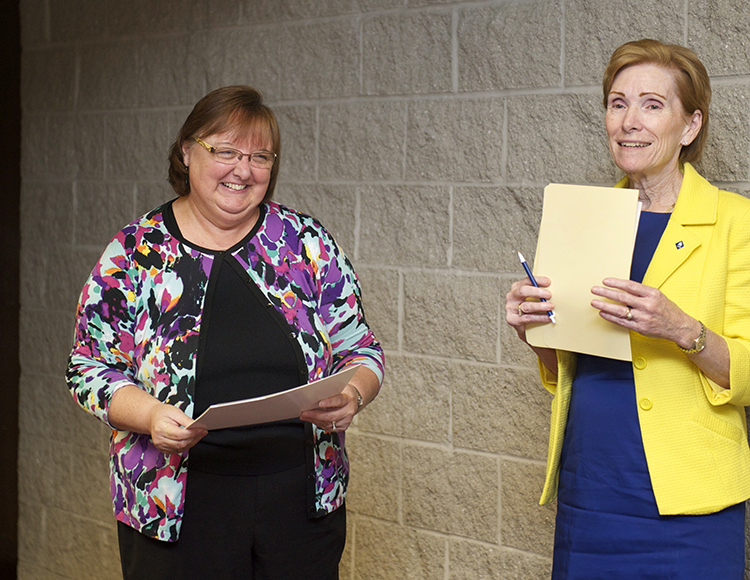 Karen's nominator describes her as a perfect example of leadership lived at UIS. "She keeps staff informed and operations running smoothly in the Chancellor's Office," the nominator writes. "Perhaps more importantly, Karen is the face of the Chancellor's Office (and a friendly face at that!) to the many students, staff and visitors who come to the office to attend appointments or to seek information." Karen is an Office Support Specialist who has been with UIS since 2009. According to her nominator, Karen has assumed more duties in the past two years, and has taken them on with a positive attitude and with a willingness to seek out additional ways to help her colleagues. "She is absolutely dedicated to the success of the Chancellor, her office staff and UIS as a whole." Evan Stanley, Student Enrollment Coordinator in Records and Registration, was being hustled by his supervisor Brian Clevenger as if they were late for a meeting. Instead, Stanley was led into a gathering for himself where he learned he had been selected as the UIS Employee of the Month for June 2013. Stanley, who has worked at the university since 2006, was nominated for his excellent demeanor with students and for maintaining a positive and professional work environment while encouraging his employees to perform their best at all times. 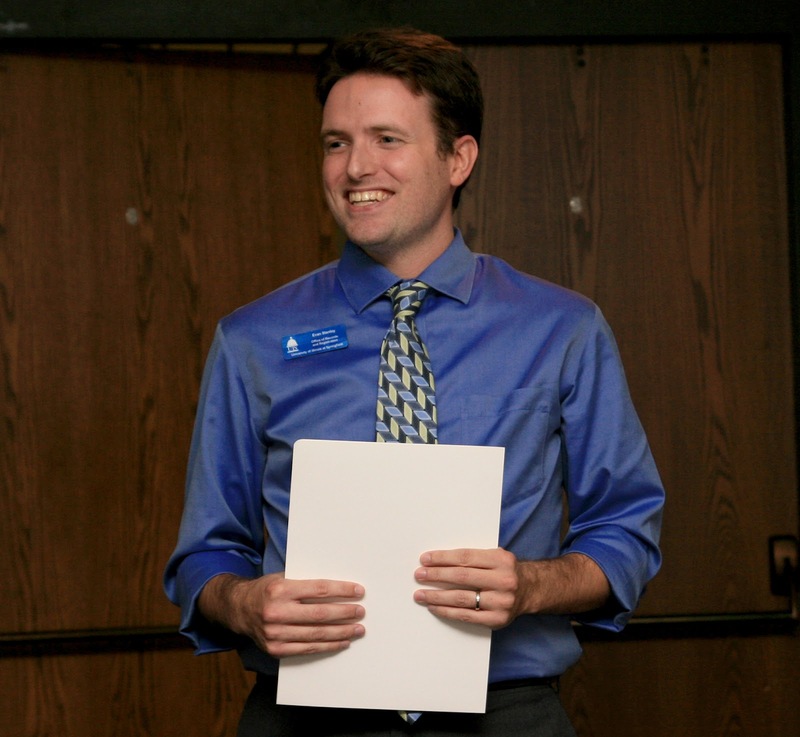 "Evan has made a positive impact at UIS through his professional approach to each challenge, consistently being a team player, and for always putting students first," his nominator writes. "He's always willing to share his knowledge and the options available to students in situations that require a lot of patience and understanding."